The Preschool is open for children aged 1 (12 months) to 6 years. We have the Kidogo group for the youngest children 1 – 3 years, and Kubwa group for the 3 – 6 year olds. “Kidogo” means little, and “Kubwa” means big in Swahili. 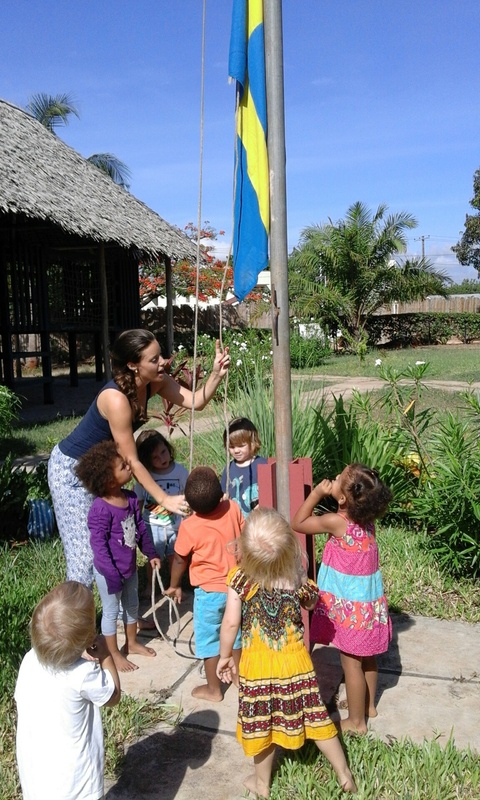 Our pedagogues are from the Nordic countries and they speak their mother language with the children. We follow a Nordic approach to education, where children develop language, life skills and physical coordination through interaction and play according to their age and individual ability. The children are taught Nordic songs, games and read books in Nordic languages. The Preschool celebrates traditional Nordic holidays such as Easter, Lucia and Christmas. In this way the children maintain their language and culture and are well prepared when they return to their respective countries. The children are also exposed to Tanzanian culture through a month-long project in every fall as well as through songs, games and regular contact with Tanzanian employees. In the morning, the children gather to eat fruit and have a common start of the day. Then the children spend time in both separate and mixed age groups performing a wide variety of activities including music, drama, artwork, swimming, sports, games and free play. Hot lunch is served between 11:00-12:00. After lunch, the children nap/rest. After resting time various activities are organized. At 14:30 it is time for a snack such as yogurt and fruits. After snack activities and play continue until the children are being picked up. The Preschool offers preparation classes where children aged ~ 4,5 – 6 years are introduced to the alphabet, basic mathematics, Nordic languages and English. Darasa means class in swahili. The class is held 3 days a week, Tuesday-Thursday. We offer this group to make the transition from Preschool to Primary school as smooth as possible. In cooperation with the parents teachers will make individual assessments when children can join the group. *Please request a complete payment policy from the office.